Introducing, our latest offering: An intensive Glacier Skills Course. It’s perfect for anyone preparing for travel in glaciated terrain (get it while you can), especially if they will be a member of a roped mountaineering team. 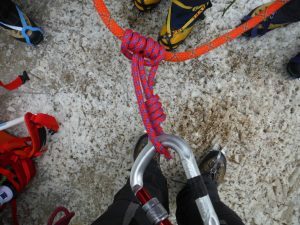 This course covers glacier travel, crevasse rescue techniques, and more, and is the next step in a natural progression for those already well-versed in the use of crampons, ice axe, and has self-arrest skills (or have taken our mountaineering skills course). So, if Rainier or some other similar mountain looms on your horizon, start here a you’ll be that much closer to your goal. Assuming you’re climbing in the northern hemisphere, the late winter and early spring are the typical times one would take this full-day course, just in time for your spring or summer climb. This course easily lasts 6-8 hours (or quite a bit longer, depending on group size). This course may also be combined with other offerings such as the aforementioned mountaineering skills course, our winter skills course, and our camp craft course, to create a complete alpine skills clinic. Please include any special objectives or learning desires you may have, if applicable, in the comments box of our Booking Form when requesting a date.